The property was gorgeous, the landscaping was amazing. I like the fact that they are always improving the property , the restaurants in particular each year we notice new and state of the art improvements. The buildings and grounds are also very well cared for. I really enjoyed the beach, the cabanas and the beautiful gardens. The property was clean and the food was good too. The food was good. The Restrooms in publis areas were always clean. The swim up room was a great perk. Beach was beautiful for the first 4 days then the next two it was covered in seaweed which they manually tried to clean all day long. Enjoyed staying at this property. Great food overall. Great staff. The place is really beautiful and the staff was awesome...but we have two negatives. One is that most of the alcohol is watered down...if you go there you might want to go to a straight bourbon or Scotch, and drink it neat. And second is the food is average at best.....I'd call it cruise ship food. Now there's plenty of it....and really I'm only talking about the dinner places. The breakfasts and lunches are fine. But the restaurants need work. Every employee was incredibly friendly, happy and helpful. Love this place! Majestic Elegance Punta Cana - All Inclusive places you next to Arena Gorda Beach and within a few miles (5 km) of other popular attractions like Hard Rock Golf Club at Cana Bay. This 597-room, 4.5-star property has a private beach, a full-service spa, and a casino. Free buffet breakfast is served each morning from 9:30 AM to 11:30 AM. There are multiple options for onsite dining with 6 restaurants, including Flavours, which specializes in international cuisine and serves breakfast, lunch, and dinner, and Limited Gourmand with its garden views. Savor a meal from the privacy of your room with 24-hour room service, or get a pick-me-up at the coffee shop/café. A plasma TV comes with satellite channels and a DVD player, and guests can stay connected with free WiFi and wired Internet. Beds are dressed in premium bedding and the bathroom offers a jetted tub, a rainfall showerhead, designer toiletries, and slippers. Other standard amenities include free minibar items, a balcony or patio, and a coffee maker. Majestic Elegance Punta Cana - All Inclusive features a private beach, a full-service spa, and a casino. You can take advantage of free parking if you drive. The 24-hour front desk has multilingual staff ready to assist with dry cleaning/laundry, tours or tickets, and luggage storage. Other amenities at this all-inclusive property include a nightclub, an outdoor pool, and a lazy river. Free buffet breakfast is served daily from 9:30 AM to 11:30 AM. Flavours - Garden-view restaurant specializing in international cuisine. Open for breakfast, lunch, and dinner. Limited Gourmand - Garden-view theme restaurant specializing in French cuisine and serving dinner. Reservations required. See and See - Beachfront restaurant specializing in seafood. Open for dinner. El Asadito - Garden-view steakhouse serving dinner. Matsuri - Restaurant specializing in Japanese cuisine and serving dinner. Reservations required. 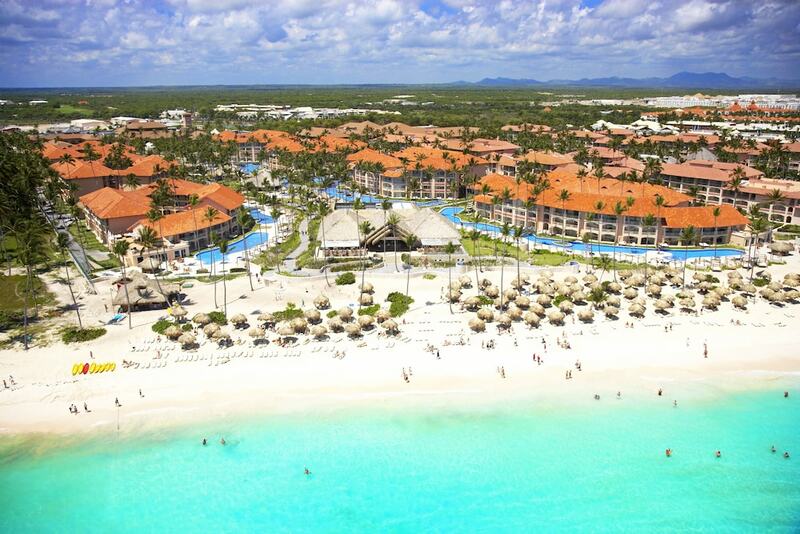 Majestic Elegance Punta Cana - All Inclusive features a private beach, outdoor tennis courts, and a health club. The property has an outdoor pool, a children's pool, and a spa tub. A lazy river, a sauna, and a fitness center are other recreation options. The nearest major airport is Punta Cana (PUJ-Punta Cana Intl. ): 29-min drive, 17.3 mi/27.9 km. Book a 5-night minimum stay in any room or rate category and receive 1 complimentary green fee at Punta Blanca Golf Course (per adult, per stay). Full details at check-in. Guests must contact the property in advance to arrange tee time; contact information is provided on the booking confirmation email. Roundtrip golf course transportation included from hotel lobby to Punta Blanca Golf Course (5-minutes away). Use of golf cart not included (USD 45 per person surcharge). Elegance Club room category: 2 Green Fees per adult per 5 night stay. Taxes and gratuity may not be included. No refunds for any unused portion of offer. Offer subject to availability. Offer is not valid with groups/conventions and may not be combined with other promotional offers. Other restrictions and blackout dates may apply.